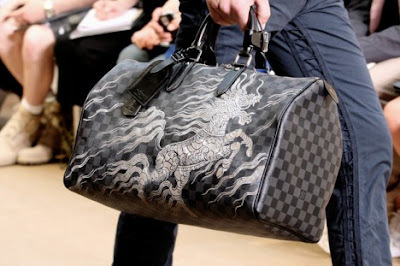 New York based artist Scott Campbell was recruited by Marc Jacobs for the Louis Vuitton SS11 menswear. 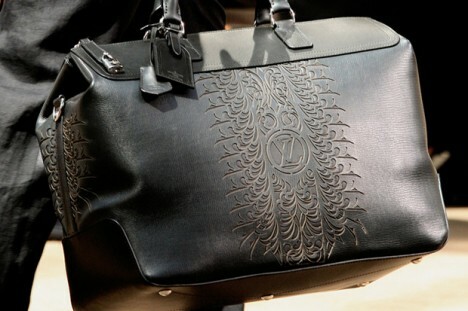 Campbell tattooed LV logos all over the runway models necks and he also customized a number of leather bags. No wonder Marc Jacobs uses Scott Campbell as his personal tattoo artist. Wow....beautiful bags! Not that the classic Louis Vuitton handbags, should be compromised or marred in anyway, but I think that they should collaborate on a collection of fabulous bags....I'm sure they would be as huge hit!